Situated on the southeast ring of the Yunnan-Guizhou Plateau, Guangxi stands high in the northwest and low in the southeast, with the highest point at 2,141 meters above sea level. Thickly crossed by rivers, Guangxi is rich in water resource. It is estimated that the surface water flowing in the province amounts to 188 billion cubic meters, accounting for 7.12 percent of the nation's total and ranking fifth among the provinces. The per capita possession of water resources in Guangxi is 4,138 cubic meters, nearly double the national average. The three largest water systems running through the province are Zhujiang (Pearl River), Yangtze and Duliu rivers. Because of the abundant water resources, Guangxi is estimated to have an energy potential with a power generating ability coming to 78.8 billion kw/h annually. Statistics of 1999 showed that existing hydropower stations in Guangxi had a total installed capacity of 6.1 million kw, with the annually generated electricity being 24.73 billion kw/h, leaving an immense room for development. Guangxi is known for having various mineral deposits, and it serves as one of the 10 important production bases of nonferrous metals in China. The number of proven mineral resources comes to 96, including 53 of which the deposits ranks 10th or above among provinces. The region has especially abundant reserves of manganese and tin, which amount for one third of the national total. In addition, Guangxi takes a leading role in having the reserves of vanadium, tungsten, antimony, silver, aluminum, talcum and so forth. What makes the province a favorite place for mineral development and production is that the mineral resources are found relatively concentrated lying beneath the earth. The picturesque scenic spots in Guangxi are famous worldwide, symbolized by Guilin, a natural beauty produced by unique karst geography. At present, the province has established several tourist attractions including three state-level natural scenic spots, 11 state-level forest parks, 30 regional natural scenic spots, 15 state-level cultural and historical relics, 221 regional cultural and historical relics and one state-level tourist resort in Beihai City. The southern section of Guangxi is ringed by seacoast. The Beibu Bay, a natural semi-enclosed bay in the northwest of the South China Sea, covers an area of 129,300 square km, with the depth of water averaging 38 meters, the deepest point at 100 meters down. Located in the tropic zone, the Beibu Bay provides a favorable environment for the breeding and growth of various fish species. It is home to over 500 types of fish and shellfish. Among them over 50 are of economic value. They include red snapper, grouper, Spanish mackerel, butterfish and red coat. The total fish resources amount to 750,000 tons. The Beibu Bay Fish Farm covers an area of some 40,000 square sea miles. By now, 929 kinds of land-based vertebrate animals are found in Guangxi, accounting for 43.3 percent of those found in China. Among these wild animals are 149 kinds which are rare species. Guangxi ranks first among the Chinese provinces in being home to the rare species of plants. About 8,354 wild plants have been found in the region, including 122 kinds which are near distinction and need special protection. Among the 670 species of fruits growing in China, 110 take their roots in Guangxi. As the tropical or sub-tropical fruits account for 80 percent of the total growing there, Guangxi is regarded as a leading province in China to produce and export the delicacies. The region is well known for high-quality shaddock, banana, pineapple and orange. The year 2001 saw Guangxi producing a total of 4.05 million tons of fruits, ranking first among the Chinese provinces. The survey made in recent years showed that the forests in Guangxi occupied a land of 13.2 million hectares, accounting for 55.54 percent of the province's total territory. Good climate and geographical location enable Guangxi to have as many as over 8,000 tree species, including more than 1,000 kinds of arbor. Most of the precious forest resources are seen concentrating in the northeast section and Baise area, where about 39 percent of the province's timber products are put out. Situated in a region at low latitudes, Guangxi borders on the tropic sea in the south, and has mountain ranges in its northern part. Yunnan-Guizhou Plateau extends into western part of Guangxi. Under the joint action of the sun radiation and atmospheric circulation, the climate here is characterized by having a short winter and long summer with the annual temperature averaging between 16oC and 23oC. The annual rainfalls in Guangxi are between 1,000 ?2,800 mm, growing gradually southward from the north. The rainfalls from April through September make up 75 percent of the annual rainfalls. The rainy season just coincide with the hot season. Affected by abnormal advances and retreats of monsoon, Guangxi often sees changes in precipitation and temperature. Drought, floods, typhoon and hailstorms may frequently hit the area. In 2003, the region invested 45.03 million yuan in tackling environmental pollution, with 196 polluters put under control. By the end of the year, Guangxi had 77 smog-control zones covering 993 sq. km and there are 53 zones meeting environmental noise standards covering 411 sq. km. 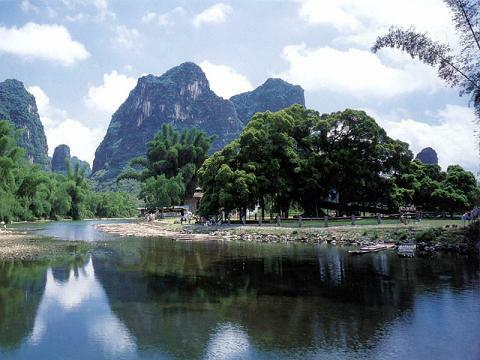 Guangxi also boasts67 nature reserves covering 1.47 million hectares. Among them 11 are at the national level. Guangxi is multi-ethnic region, where a number of ethnic groups live, including the largest groups such as the Zhuang, Han, Yao, Miao, Dong, Mulam, Maonan, Hui, Jing, Yi, Shui and Gelao, and some 25 smaller ones. The people of ethnic minority groups came to 17.956 million by 1999, accounting for 38.1 percent of the region’s total. The Zhuang is the largest ethnic minority group in the region, which has a population of 15.38 million. Revenues: 34.14 billion yuan in 2003. Industrial added value: 81.148 billion yuan (2003), up by 14.7 percent on the previous year. Agricultural output value: 96.558 billion yuan in 2003, up by 4 percent from 2002. Foreign trade: The total foreign trade volume reached US$3.19 billion in 2003. The year 2003 saw the actual utilization of US$690 million of foreign investment, up by 11.3 percent from the previous year. Of the figure, US$456 million were foreign direct investment. A total of 28 transnational companies had projects in Guangxi during the year. Per capita disposable income of urban resident: 7,785 yuan (2003), up by 6.4 percent. Per capita net income of rural residents: 2,095 yuan (2003), up by 4.1 percent. (4) Machinery industry (automobile, internal-combustion engine, engineering machines, agricultural machines, electric devices, petrochemical equipment, heavy-duty machines for mining, packaging equipment, equipment for sugar producing, power-generating equipment). The rail line in operation totalled 3,120 km. The total highways open to traffic were 51,378 km long. In 2003, the express highways from Liujing to Xingye and from Nanning to Tanluo were completed and open to traffic, adding the total length of express highways to 1,011 km. Guangxi has a coastline stretching for 1,595km, along which 21 ports have been established, including 18 large-capacity and deep-water berths. Fangcheng, Beihai and Qinzhou ports have an annual handling capacity of 12.56 million tons of goods each. Guangxi is believed to be the best place in south China to do sea transportation because of its geographical location. Guangxi has five airports respectively in Nanning, Guilin, Beihai, Liuzhou and Wuzhou. Twenty-three airliners are operating 109 air routes (including 99 domestic, five regional and five international ones). A city well worth the visit is Guilin. The city is located in the northeast of Guanxi region with a population of 1.35 million. Its name means "forest of Sweet Osmanthus", referring to the high numbers of fragrant Sweet Osmanthus trees located in the city. A well known saying among Chinese people is that `Guilin`s scenery is the best among all under heaven.` Many people who already visited this city truly agree with this. Guilin, surrounded by two rivers, four lakes and studded with mountains with unusual rock formations offers stunning breathtaking views that are very unique of its own and therefore is one of the best-known tourist destinations in China. Major attractions that we can find in Guilin are: Elephant Trunk Hill well known because it is the most famous mountain, Reed Flute Cave (Ludi Yan) with its largest and perhaps the most spectacular limestone cave in Guilin and Seven Star Park that boasts a Stone Museum where amazing geological finds are displayed. Believe that each of these places will leave you the lasting memories. 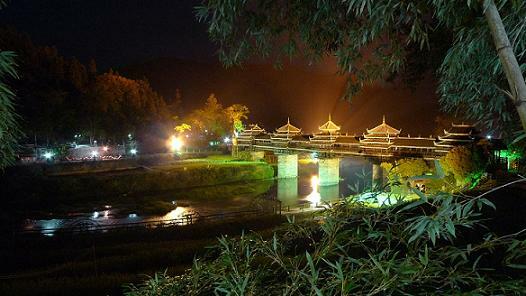 Also many scenic places can be visited within a short traveling distance of Guilin. For example: The beautiful `Li Jiang River` scene which you can find on the back of each 20 Yuan banknotes or `Longsheng` can also be recommended with its famous Longji rice terraces and a small city that is located downstream from Guilin named `Yangshuo` is also nice to visit. All combined together makes Guilin a perfect base for exploring the northern end part of Guanxi region in China. In a cult-``-ural point of view, Guilin has also much to offer. Like the history that goes back more than 2000 years ago. Guilin has been the political, economic and cultural center of Guangxi since the Northern Song Dynasty (960-1127). Solitary Beauty Peak is considered to be the oldest place of interest and has been so since the far off days of the Southern Song Dynasty (1127-1279). When visiting Guilin you can immediately notice a wide variety of ethnic minorities which all have their own culture with its own customs and festivals that creates an inviting atmosphere and a unique experience. Guilin doesn`t have hot summers and cold winters. Flowers are blooming throughout the year, making all four seasons of the year very suitable to travel here. Guilin is a city which is well developed throughout the years with a decent infrastructure network. Moving around the city is none of a problem. Many buses are available (some free of charge) and there are also plenty (luxurious) hotels and hostels to find in Guilin. 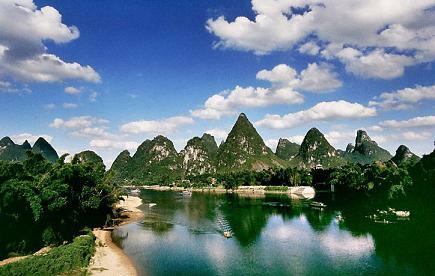 Just remember that Guilin is entirely ready to welcome all of its guests with its beauty and warm hospitality. Located at the terminus of the Li River, the small town of Yangshuo has long been a mecca for backpackers, but long before that, it was a geomancer's delight too. The special geography gives it breath-taking beauty while over 1,400 years of history bless it with a deep traditional culture. The diverse ethnic minority groups including Hui, Zhuang, Yao and others, enrich it with special folk cultures represented by their various festivals; while many foreign residents add exotic flavors to its fascination. The famous Li River traverses the county and brings it the most beautiful scenery. Along the extremely pure river, thousands of hills stand in different poses and with different expressions, such as Moon Hill, Mural Hill and Schoolboy Hill which is the natural stage of the world famous opera 'Impression on Sanjie Liu'. Sanjie Liu is a fairy singer in the legend of the Zhuang minority group. Big Banyan, a huge tree with a history of over 1,400 years, is said to be the place where her love story happened. The 'Little Li River'- the Yulong River �C is a paradise for a cruise because of its green hills, silky water and ancient bridges. You can also go to Xanadu, a primitive minority village full of folk culture and tranquil rurality. Streets in Yangshuo are well kept in the original style, presenting the simple and primitive atmosphere of the ancient town. West Street is the most exciting one that locals call the 'Global Village'. There are not only many foreign tourists, but also quite a number of foreign residents managing cafés and restaurants. The exotic flavor, combined with the traditional culture, make the West Street world famous. Yangshuo also attracts tourists with its delicious specialty foods, such as Beer Fish, Niang dishes and special snacks including rice noodles and various glutinous rice cakes. You can taste them in most streets of the county. The local specialties such as the Shatian Shaddocks, the kumquats and the Chinese chestnuts are worth tasting as well. If you want to buy some souvenirs, painted fans, embroidered balls, and painted shirts are all good choices. You can buy these articles both in the tourist spots and in the malls of the county. Visitors to Yangshuo can swim in the Li River or the cleaner Yu Long (Dragon River), climb one of the many nearby karst peaks or hire a bicycle for a cycling trip through the karst scenery. Additionally, there is a butterfly cave near the town and a number of cave systems. Yangshuo is also China's foremost venue for rock climbing, with around 300 bolted routes and several companies offering guiding and equipment hire. With mountain biking and kayaking becoming more popular, Yangshuo is becoming an adventure sports centre as well as a stop on the traveller's trail. Most of the original culture of the town has been absorbed into the tourist industry. For example, you can "rent" a fisherman with cormorants to watch him go fishing with them. You can also "rent" local women, in traditional ethnic dress, to pose for photographs. Pleasant climate endows the city with evergreen trees and fragrant flowers all year round, hence the name 'Green City.' In such a beautiful land, more than 30 ethnic minority groups have been living harmoniously for 1,680 years. Zhuang is the largest minority group of China. Over 90% of them live in Guangxi. Their history and ethnic culture add charm to the city. For centuries, Nanning played the role of an important military post guarding the Chinese empire's southwestern border. Its name, meaning "Peace in the South", is well justified. Nanning is also known as Yong, a nickname inherited during the Tang Dynasty because of the River Yong which passes through the city. Over the years, Nanning increasingly grew in importance, and during the Yuan Dynasty it replaced Guilin's position as the capital of the Guangxi province. Nowadays, Nanning's key role as the transportation hub of China's southwest sea trade routes is probably what most people are familiar with. 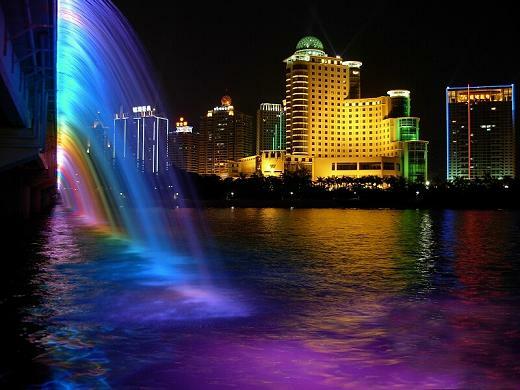 Chongqing, Chengdu, Kunming, Guiyang and the seaport city of Beihai all link directly to Nanning. But besides being the starting point of a trip to Guilin or Vietnam, Nanning possesses a charm of its own that may surprise many. The year-round amiable climate, lush sub-tropical greenery and extraordinary sites in and around the city make the place a pleasant two to three day stop before you head off for other attractions in the province. The River Yong runs across the city and distinctively divides it into northern and southern halves. The city is encircled by small, green hills and dotted with numerous lakes, ponds and parks. Upon arrival, any visitor will be impressed by the abundant green trees, brilliant perennial flowers and plentiful balance of sunshine and rainfall. It is no wonder many call Nanning the "Green Capital" or "Garden City". Taking a stroll through the city, you will feel the subtropical atmosphere instantly. All fourteen main streets are lined with trees, such as sweet peach, betel nut and palm trees, and green plants make up 31% of the city's land area, making Nanning one of the greenest cities in China. There are many parks and gardens within urban Nanning and its outskirts. Among them are the White Dragon, South Lake, West Suburban and Qingxiu parks, the Guangxi Medicinal Herb Garden and the Guangxi Ethnic Relics Center. Located in the north part of Guangxi Zhuang Automomous Region at the middle beaches of the Xunjiang; in the joint area of Hunan, Guizhou and Guangxi provinces, surrounded by mountains. 113km east of Congjiang[Guizhou province], 65km west of Longsheng. The Sanjiang Dong Autonomous County is the only Dong county in Guangxi. The small and untidy seat is an obligation stopover if you enter Guangxi from southwest Guizhou. Sanjiang features well-preserved Dong villages with their wooden houses, drum towers and shelter bridges which dot the countryside hereabouts, The Dong makes up 50% of the population in Sanjiang. The other nationalities inhabiting there are Han, Zhuang, Miao, Yao, Menchu, Hui, Maonan, Gelao and Yi. Dong people in Sanjiang have a very unique food culture. Sour dishes are their favorite. Almost all kinds of food they make are served in sour flavor.